Papanek goes on to vent at industrial designers for their part in the creation of such over-consumption. Recently however, the more altruistic form of design (now often referred to as “social design”) has made a recurrence, and includes products and services intended to improve people’s - particularly those living on the margins - quality of life, the sustainability of society (including, unusually for designers, encouraging reducing consumption rather than driving it) and other such laudable aims. The RSA has a long history of involvement in this sort of design, from awarding George Smart their gold medal in 1805 (and Joseph Davis the silver in 1806), to the Design Directions briefs set over the last few years, which explore how design can help meet the key challenges facing today's society. One key challenge that has become a hot topic of the public sector in recent years is the need for individuals to change their behaviour; it crops up on the popular shelves of bookshops in books like Nudge, on the desks of policy makers in the form of reports and in the Great Room at the RSA in the form of a speech by David Cameron to name a very select few. The reasons behind this attention are varied but include; emerging massive and complex problems like anthropogenic climate change that require bottom-up as well as top-down action, a desire to involve citizens in more decision making, and increased understanding and awareness on the part of government of the effectiveness of softer interventions in addition to traditional incentives and legislation. The RSA’s vision of closing the gap between the society we currently inhabit and the one we aspire to also involves a degree of behaviour change. We're all fallible and often end up behaving in ways which are inconsistent with our values and the society in which we would prefer to live. And although that individual behaviour (like leaving our telly on standby) can seem inconsequential, sometimes the cumulative effects (like a power station’s CO2 emissions) are damaging to everyone. Encouraging behaviour change is notoriously difficult, but novel approaches are emerging. Research from the interface of psychology and design, for example, offers new possibilities for transforming how we use everyday objects like cars, mobile phones and domestic appliances. In a world in which the products and services we use increasingly influence the pattern of our lives, perhaps design that changes behaviour is as socially valuable now as the 19th century chimney brushes were. The RSA is exploring the potential for a project that will investigate the role of so-called “persuasive technology” and other techniques from design to help create the society we aspire to. How do you think the products and services you use everyday change your behaviour? What do you think the RSA could bring to this field of research? It would be great to hear what you think, particularly if you are interested in behaviour change or design and/or you are a Fellow of the RSA. 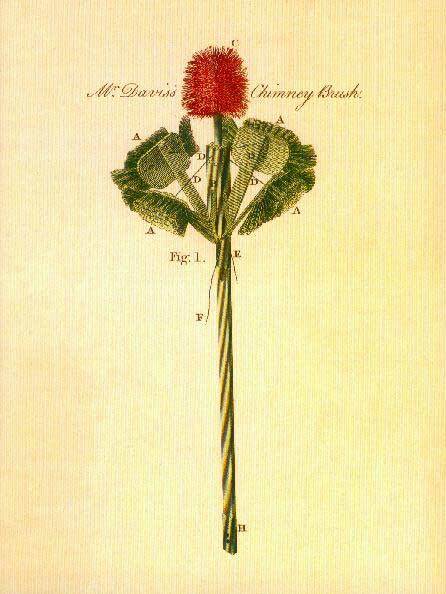 There seem to have been quite a few chimney sweeping brushes submitted to the RSA in the early 1800s. BM Forster of the Society for the Suppression of Climbing Chimney Sweepers wrote of Joseph Davis's device: "I am convinced that chimnies may be swept as cleanly and effectually, as is commonly done with climbing-boys, so that the difference to the families who employ your machine will be, that they have the same comfort of a clean chimney, and are satisfied that they no longer use a method which is full of horrors and a disgrace to a civilised country". Papanek, V., (1985) Design for the Real World: Human Ecology and Social Change. Academy Chicago. The New York Times blog dot earth has picked up on Francesca Galeazzi's Justifying Bad Behaviour piece for Cape Farewell.